Got a question you want answered about Riverlink? Ask us below and someone from the Project Team will get back to you as soon as they can. What about access for disabled people? A whole area of society can't visit the Hutt River let alone swim in it. How about following some other countries ideas of disabled access right to the waters edge. It would be a first for Wellington and another draw card to the Hutt. While some people may scoff at this, you have no idea the amount of families this would effect, mine included. It would be great to be able to take my family member in a wheelchair down to the river bank and right up and into it!! To have a safe area with lots of seating and facilities so we can watch as they enjoy what a real kiwi swim is like. Please accept our apologies for the delay in responding. We can understand your family’s frustrations with the lack of swimming options, and your suggestion is something we are considering at present. The entire corridor of the project will be designed for wheelchair access, as well as for pushchairs and people who are able to walk but with some difficulty. This is a very important design aspect. Wheelchair access into the water is currently being worked on. The challenge here is finding a ramp design that can withstand flooding of the river without sustaining too much damage, or a design that is easily repaired. I found the NZTA page on Melling Intersection improvements a bit vague. Does NZTA have more definite goals for SH2 improvement? Do they want to remove traffic lights from SH2? Do they want to increase grade separation and cross traffic separation? Are we likely to see more interchanges in the style of Dowse/Haywards? Some cross references to existing transport plans may help in understanding. The NZ Transport Agency continues to work with its regional partners to explore potential improvements to State Highway 2, particularly those with high safety and/or economic benefits. We do not have a specific goal to remove traffic signals, as they can be an important component for safety. Given grade separation has both safety and efficiency benefits, they will always be considered as part of the solution for increasing demands on roads. However such projects need to be appropriate and prioritised depending on funding. With regards to the Melling intersections specifically, the Transport Agency is committed to working with Greater Wellington and Hutt City councils to find a solution that works for transport, resilience and urban regeneration. The Hutt River appears to become more and more like a Willow lined canal every year. Not only are the willows a pest, they obscure visibility of the river and restrict access to it. What steps are being taken to reduce the use of and remove Willows, perhaps by using Natives, and by alternative methods of influencing the river's path? Hi There- Thanks for your question. The community design workshops we held in 2016 have given us a good idea of preferences to consider as part of our design and use of both native and exotic trees and plants were found to be popular, as are a range of other river and berm designs. Added to this community input is advice from ecological consultants, changed best practice approaches and our own experience of river management. All of this is informing the design along the river. 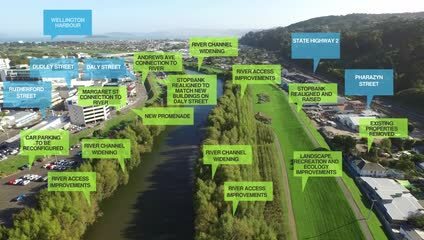 We have prepared environmental design concepts for the Kennedy Good Bridge to the Melling Bridge part of the river, which are at the pop-up hub currently and also loaded on this website. (Check out the Preliminary landscape and environmental design concepts box on the right side bar on the main page of this site. This was only added yesterday so sorry about that). These designs include a mix of wetland, willow, native tree glades and open spaces. If you would like more information feel free to email citycentreupgrade@gw.govt.nz.